Our strawberry plants are being tended much more diligently than usual this year. I had really given up on the strawberries, as they are such slug magnets and I want the sunniest spaces for my tomatoes and zucchini. But my little girls are not so jaded, and they claimed a huge pot and chose blooming strawberry starts at the plant sale. They watch them closely and water them daily. For their efforts, they have been rewarded with some hard little green nubbins that even the slugs still scorn. June-bearing, my foot. So I am clearly jumping the gun by buying strawberries so early in the year here in Seattle. But I have seen the photos of your gardens elsewhere, and I don’t want to wait until it’s too late to get this recipe to you. 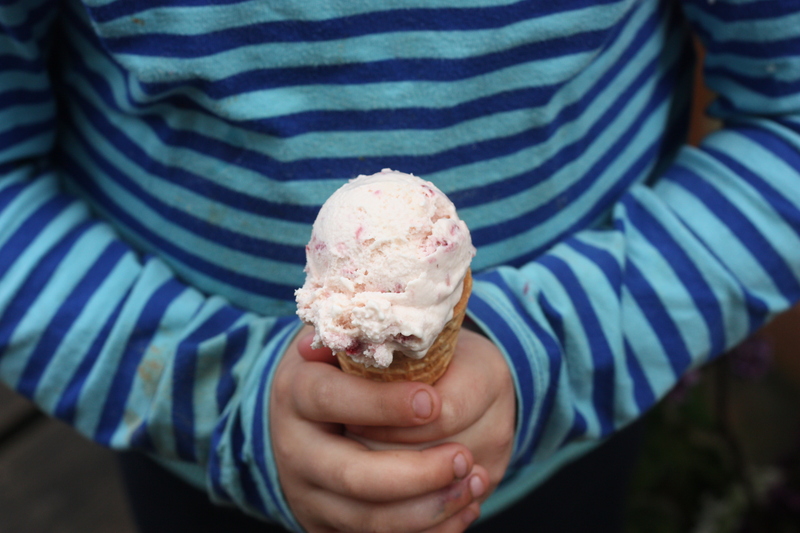 Besides, it’s been an ice-cream-making kind of week around here–it’s never the wrong time of year for that. This recipe is from David Lebovitz’s inspiring book The Perfect Scoop, which makes me want to make so many frozen confections. This year I’m definitely going to try the parsley ice cream. Strawberry Frozen Yogurt: Rinse, hull, and slice a pound of strawberries. Transfer them to a bowl, stir in 2/3 c. sugar and 2 tsp vodka or kirsch (optional) until the sugar begins to dissolve, then cover and let stand at room temperature for an hour, stirring occasionally. Puree strawberries and their liquid with 1 c. plain whole-milk yogurt and 1 tsp. freshly squeezed lemon juice until smooth. Refrigerate mixture for at least an hour, then freeze in an ice cream maker according to the manufacturer’s instructions. This entry was posted in Desserts, DIY, Feeding Kids, Food, Recipes and tagged cooking, dessert, DIY, family, food, homemade, kids, lifestyle, recipes on May 19, 2012 by emmycooks. what an easy recipe! I have to try this! thanks! It is! I am always scared of the eggy custard ice cream recipes, but this one I can handle! me too! They never mix right for me! Thanks for making it so simple! I think this would be lovely as well with aged balsamic instead of the liquor. I’ll post about balsamic-honey macerated strawberries soon. By the way, you can get rid of the slugs by using non-toxic iron(3)-phosphate. It is approved for organic farming and works very well. I expect it will depend both on the yoghurt and the balsamic. It would be awfully decadent to use 25-year-old artisan balsamic (over $100 for a 3.5 oz bottle) for this, but oh so good :-) A mellow yoghurt is probably a good idea. I’ve never tried frozen yoghurt to be honest, always use whipping cream to make icecream. p.s. I don’t really put anything (even organic) in the garden because the kids play and dig in there. I do set beer traps for the slugs, though, and feed the ones I catch to my chickens! It does say “safe for pets and humans” on the box, but I understand. Thanks for the idea, my mom loved it! Awesome! How much would you go up to next time? And I love the idea of drizzling a (good! syrupy!) bit on top as well. I love froze yogurt and this looks wonderful! This looks amazing! And what a great photo! It really made me smile! Parsley ice cream sounds delicious and amazing. I can’t wait to see how it turns out! This looks delicious! I’ve seen a lot of recipes for ice cream lately but none for frozen yogurt. I think this will be a perfect summer treat! The Perfect Scoop has a bunch of great-looking frozen yogurt recipes. I’ve made this one and peach, but I will be trying more! This seems like a healthy alternative to making ice cream from heavy cream. My strawberries will be coming in soon–thanks for the idea! Let me know if you need any tips for fending off the slugs… I have LOTS! And there are even ones that your girls can help with. Sorry i dont have any posts about slugs, it doesnt really fit with my blog. One of the most effective things in warding off slugs that I use is copper. Get some rolls of pennies, and place rings around the crowns, and any of the strawberry plant that is touching the ground. If your plants are in pots, gardening stores sell copper tape, and I find it works pretty well. I keep my strawberries in pots on the patio, and use the tape on the box closest to the ground, and the slugs don’t seem to bother them. I also think egg shells help, though I have seen slugs cross over them when they are desperate to get to my dahlias. (that was when I started the penny circles) when we use eggs, I inse the shells, then cook the empty shells in the microwave for a couple of minutes to dry them out and kill the bacteria. Crush them gently, keeping sharp jagged pieces that the slugs supposedly don’t like to cross. It is also good fertilizer for your plants. I keep the egg shells all year and store them up for slug season so that I can place rings around any plant that needs it. Beer does seem to work, though I have abandoned it for the “worry free” slug and snail bait. It is 1% iron phosphate and 99% inert ingredients, and is safe for pets, though it does say keep out of reach of children. You may be able to sprinkle a bit in places where the kids don’t go, to help control the population. I sprinkle it everywhere, and I look in all of their “hiding spots” to nab them. I thought maybe you’d posted about keeping your infusion ingredients safe in the garden. :) Ok, I am going to get copper to put around our big strawberry pot (or pile pennies all around, the kids would LOVE that) and I’m going to scatter jagged eggshells all though the patch that sprawls out from the garden beds. I have a good supply of eggshells because we have chickens and eat tons of eggs! I love these ideas, thank you so much!! I will definitely report back. Yum! Good idea with just buying the strawberries, mine always get eaten by slugs too.